The Liberty Bell in Philadelphia; photo by Serguey on Wikipedia (use permitted with attribution). unto all the inhabitants thereof... "
This third Liberty Bell cracked sometime between 1817 and 1846. The earliest known use of the phrase "The Liberty Bell" was by the American Anti-Slavery Society - it appeared in the February 1835 issue of "The Anti-Slavery Record." 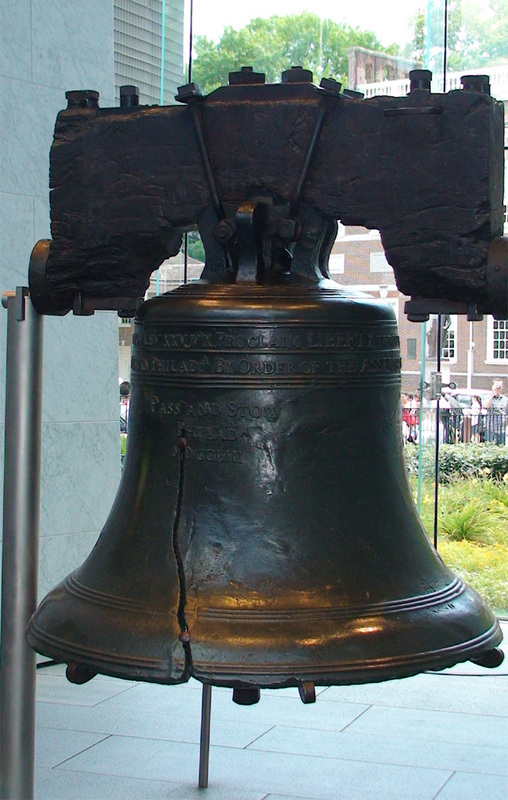 On July 8, 1776, the Liberty Bell summoned citizens of Philadelphia for the reading of the Declaration of Independence. The Liberty Bell was also rung previously to announce the opening of the First Continental Congress in 1774 and after the Battle of Lexington and Concord in 1775.